Jesse Nissim is having a breakout moment. In an industry that thrives on splashy debuts, the poet, who also is a Humanities Faculty Fellow in the College of Arts and Sciences, is reaping the benefits of a steady ascent. 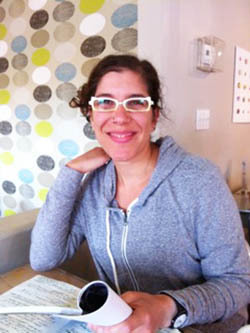 Case in point: Nissim has just published her first full-length poetry collection, “Day cracks between the bones of the foot” (Furniture Press Books, 2015)—not to be confused with her similarly titled chapbook from two years ago. A full-length follow-up, “Where they would never be invited” (Black Radish Books), is in the works for next year. Meanwhile, the honors keep rolling in for the decorated postdoc, including the 2013 Editors’ Prize from the Spoon River Poetry Review for her poem “Fire,” selected by renowned poet Juliana Spahr. Nissim has also enjoyed residencies at the Ragdale Foundation in Lake Forest, Ill., and the Constance Saltonstall Foundation for the Arts in Ithaca, N.Y.
Closer to home, she coordinates the college’s First-Year Seminar (CAS 100) program, designed to help undergraduates master academic writing through innovative, thematic coursework. 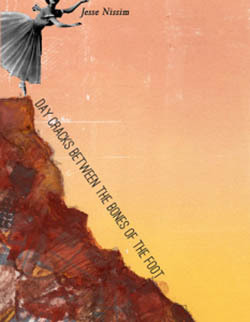 Already, “Day cracks between the bones” has been selected as a finalist for several literary awards, including top prize from the National Poetry Series Open Competition, first prize from the Cleveland State University Poetry Center’s First Book Poetry Competition, the Kinereth Ginseler Award from Alice James Books, the Poets Out Loud Prize from Fordham University Press and the Brittingham Prize in Poetry from the University of Wisconsin Press. Nissim also has three other chapbooks to her credit: “Nesting Instinct” (Nous-zot Press, 2014), “SELF NAMED BODY” (Finishing Line Press, 2012) and “Alphabet for M” (Dancing Girl Press, 2007). She has published more than 30 poems in such forward-looking journals as 26: A Journal of Poetry and Poetics, Barrow Street, Fourteen Hills: The San Francisco State University Review, Handsome, H-NGM-N, Mad Hatters’ Review, La Petite Zine, Really System, Requited, RHINO, Shampoo and Sixth Finch. And she has written multiple interviews and reviews, including a conversation with University poet-activist Minnie Bruce Pratt for Stone Canoe. A purveyor of experimental poetry, Nissim makes a special point of innovation, as evidenced by her CAS 100 syllabus, which highlights latter-day poets as diverse as Harryette Mullen, Dorothea Lasky, Thomas Sayers Ellis, Emily Dickinson, Audre Lorde, Jack Spicer, Ann Carson and Inger Christensen. “I love introducing undergraduates to stunning and moving poetry across an aesthetic range, proving there’s no artistic boundary to what a poem can or should do, although we can argue there is an ethical one,” Nissim says. Nissim also teaches creative writing and gives public readings at the Downtown Writer’s Center, which is part of the Arts Branch of the YMCA of Greater Syracuse. Originally from Baltimore, Nissim has held faculty positions at the University of California, Berkeley; the California College of the Arts; Diablo Valley and Chabot colleges; and San Francisco State University, where she earned an M.F.A. in creative writing. “There’s a permeability [to her writing], a willingness to attend to the spaces between things, to the gaps in our very selves,” Christle adds. The College of Visual and Performing Arts (VPA) has announced that Milton Rubén Laufer, a pianist and scholar and current director of Western Carolina University’s School of Music, has been named director of the Rose, Jules R. and Stanford S….